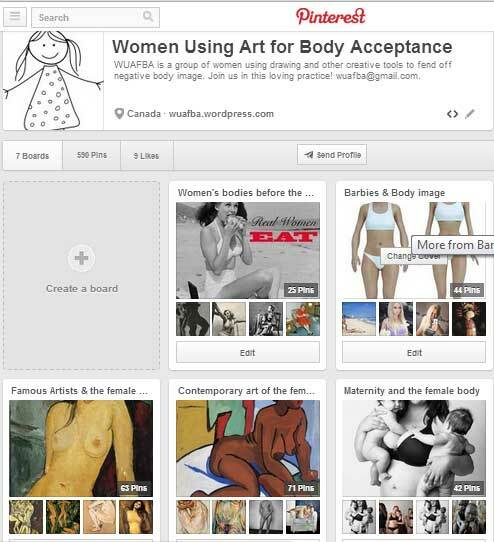 Women Using Art for Body Acceptance (WUAFBA) is a group of women, each of whom has suffered from negative body image and who are witnessing friends, daughters, nieces, and grand-daughters go through similar questioning about their bodies. For many years we have used art, writing, and drawing in particular as tools to soothe the pain of our own self-judgement. These tools have given us the gift of a change in perspective – the ability to see beyond outer appearances and the possibility of learning to love and accept ourselves just the way we are. It is not a quick fix; its a process, a practice, that we wish to share. We do not call ourselves artists because we have not formally studied art, however, we all recognize the value of the creative processes to help us grow, and we have all experimented with our own image in developing this practice. We believe the lack of self-acceptance that causes body image discomfort – from mild self-judgement to full-blown eating disorders – is a terrible misconception; a false vision of ourselves that can be transformed, and by drawing our bodies and expressing our feelings about our bodies, we begin to make peace with ourselves. Having rediscovered simple, natural beauty by photographing and drawing our own bodies and others, we plan to publish the artwork, whether elaborately illustrated or simply traced, that has helped reveal another self to us, something other than the one we usually saw in our minds and in our mirrors. Using self-portraiture and drawing other bodies brings about a shift in perception. This process is eye-opening, and it’s often quite surprising to discover how differently others see us compared to the way we see ourselves. You are invited to join this movement towards more positive body image by sharing your reactions to our work as well as your own experience with this creative process of learning to see yourself and others differently. To collaborate by photographing yourself, drawing and/or sharing your vision of others in writing, please contact us for guidance and feedback. To maintain privacy, photographs shared for drawing purposes are only seen by the artists working on them, and all collaborators may use a nickname or an alias. This site will document the process as the book we are producing takes form.